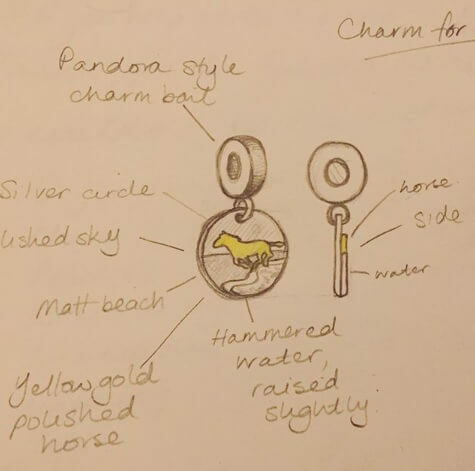 It’s always exciting when I get asked to make something a little out of the ordinary, and David set me a fantastic challenge to design and make a custom charm for his wife Cathy’s charm bracelet. Cathy has a bucket list of experiences she is working through and top of the list was to ride a horse along the water’s edge at the beach. David organised a wonderful trip where she fulfilled this dream. It was such a special day, he felt it needed to be immortalised in a memento she could add to her charm bracelet. We discussed some ideas over the phone and then I set to work drawing up my interpretation of the brief, which I emailed over to David. The design consisted of a round disk of silver with a polished sky and a textured area from the horizon down to represent the beach. The water is depicted with a hammered layer of silver which sits on top of the sand. 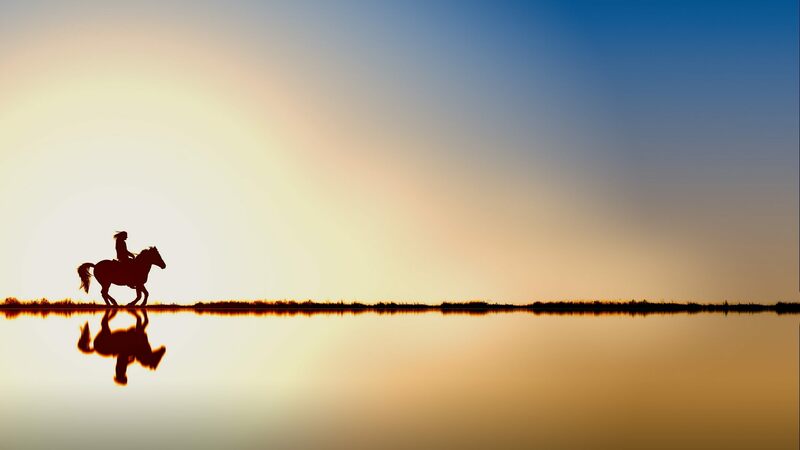 The silhouette of a running horse takes pride of place in the centre. 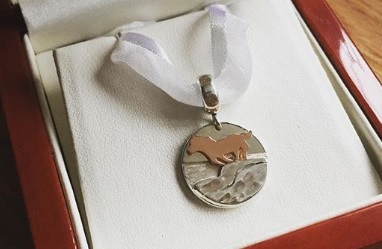 I initially designed it with a yellow gold horse so the colour contrasted with the silver, but we switched it for rose gold once David had taken a look at the sketch. I began work on the charm by making the layered silver disk. I am so pleased with how the light reflects on the texture of the sand. The charm hangs on a special bail which will fit on Pandora charm bracelets like Cathy’s. I presented it on a white ribbon inside one of my polished mahogany jewellery boxes ready for David to present it to Cathy. 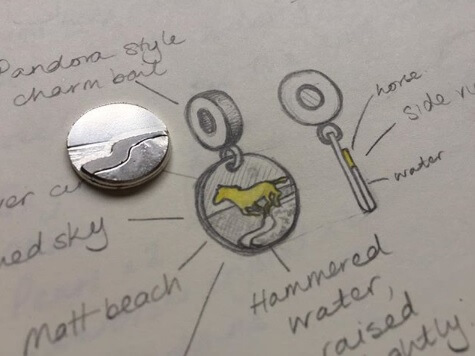 If you have an idea for a special piece of jewellery, why not get in touch and design something really special from scratch.